Mralc's IT Blog | Random fixes to IT problem i have come across! The last group policy applied is the settings which are applied to the computer or user. Setting enforced on group policy overwrites any below group policy object and ignores Block inherence set on an OU. Loop back policy,This can be applied on a OU via a group policy. Then this group policy is applied last,This is handy when you want to set user setting only to be applied to a user when then log on to a terminal server. HP Array cards which have no BBWC only support Raid 0 and 1. If you add a BBWC(Battery-backed write cache) it add extra memory to the cache and provides battery backup so if you lose power to the server. The data is saved in the cache which had not been written to the disk at the time of the power failure . When the power is restored to the server the raid controller continues where it left off and writes the data to the disk. You can see the text in red show it has a Battery and Cache module installed and the Accelerator Ratio. To do any task which you require a BBWC, make sure you have a battery present and is fully charged if you not you can not perform any of these task. Drive Write Cache: If enable means the array will use the onboard cache on the hard drive. It will write the data here first and then to the disk. If the server is not procted via UPS and looses power. Data in the cache will be lost and cause data corruption on the hard drive. No-Battery Write Cache:If you have no battery installed or it is failed you can enable this feature to use the on-board cache of the raid controller.But if the server is not protected via UPS and looses power. Data in the cache will be lost and cause data corruption on the hard drive. Copy the ACU folder to ESXi via Datastore Browsers. SSH on to device, and Change to the directory in the VMFS store where you upload the ACU folder. 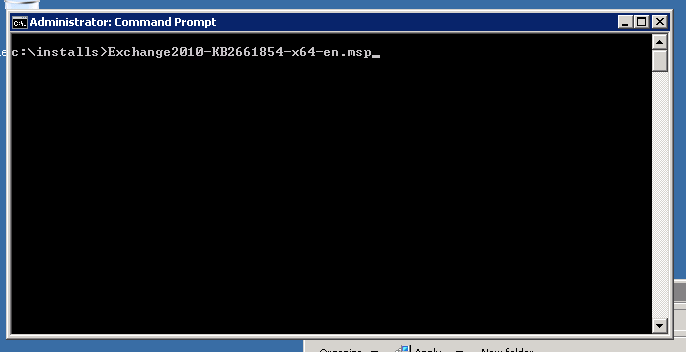 On Esxi 4.1 and you are running hpacucli command line to manage array on a HP smart raid card. Once you have the PID run the ‘Kill’ command followed by the PID. To kill the process, you should then be able to run the hpacucli command. I have been testing upgrading vSphere 5.0 to 5.1, The first prerequisite is that you need to install VMware Single Sign On. When you install this you can either use the built in SOL express or use full blown sql and then create your own database as describe in the user guide. I could not find any documentation from vmmare if the single sign on supports SQL named instances. I found something that it does not support SQL cluster database. there was nothing listing on that port. Only the default instances of the SQL uses that port. All SQL named instance uses a dynamic port. If you use “SQL Server Configuration Manager” look under Protocols for that instance, Doube click on the TCP/IP, Then click on IP address tab and scroll down to the bottom it shown you the dymanitc port the name instance is using dynamic port in my case 49325. 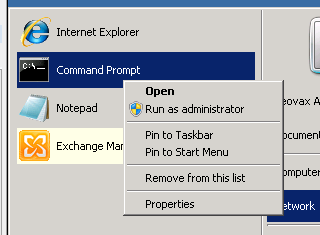 On the datebase information screen, change the port from to 1433 to 49325. Making sure you have entered the FQDN of the sqlserver,Database name,Username and Password. You will be able to click next and get to the next page. Obviously this a dynamic port which mean that it may change on the server when it get rebooted or when then the service is restarted. You can set a static port manually. Go back to the same place in “SQL Server Configuration Manager” as before and scroll down to the bottom and you can enter a static port under used port into the “TCP Port”. I chose 1435. Just stop and start the sql service to make the change happen. If you need to rename a folder in vmware via Datastore Browser. In my case I copy a Virtual Machine folder to a new VMFS volume and wanted to rename the original folder for the rollback plan encase anything went wrong. If you try and right click the folder on the left hand side pane to rename it. There no option to rename it. Dont worry you can select the top level folder (/) on the left hand pane so that you can see the folder on the right hand pane. Right click the folder and the option is there to rename it. 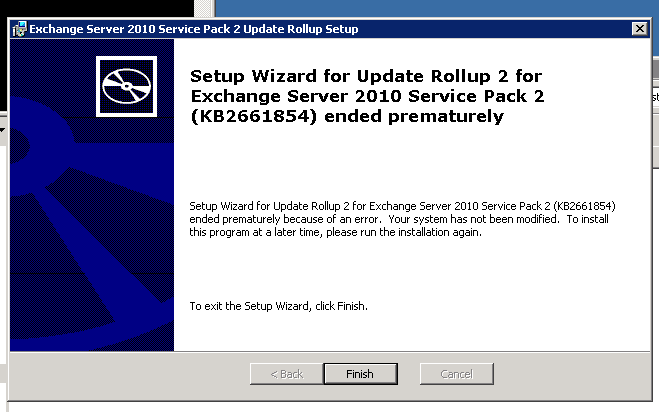 When you are trying to install Update rollup 2 for Exchange 2010 Service Pack 2. The setup will stop and display the above image. But this can be as this update is not a exe but a msp file. 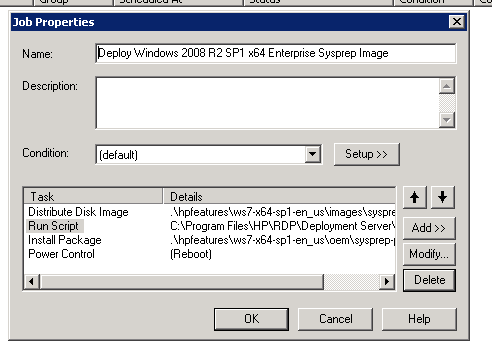 If you are using HP Insight control 6.3/7 to deploy server via the Deployment console (Symantec Altiris) and deploying a windows 2008 R2 sysprep image with a image you have already capture. Once the job has completed it has not deployed any of the information from the sysprep xml file.The main thing you will notice is that the server has keep the server name of the original server which was imaged and the computer object in Deployment console will change from the name you have chose to name of the original imaged server.Also you will get prompted to set the password for the Administrator. There seem to be a bug in Version 6.9 SP5 MR1. The standard sysprep image job does not copy the sysprep.xml to the correct locations. The Job renames the sysprep.xml to a unattend.xml file and places it in %WINDIR%\System32\Sysprep directory. The problem is that when the sysprep job get to stage where it looks for the answer file for the windows setup, it looks for the unattend.xml file in the %WINDIR%\Panther directory. When you run a capture image job to be use with a sysprep job. The system which is to be imaged is put in a sysprep mode so that it is ready to be imaged and then can deployed using sysprep. Before it is imaged the job inject a system built unattend.xml in %WINDIR%\Panther director. So once the system has been imaged and has been rebooted it can turn the machine back to it pre sysprep state. The one thing it can’t do it guess the password and that why you are required to change the password for the administrator account. To Fix this you first need to add a task and to the job after the system has deployed imaged so that it copy the file to the right location. 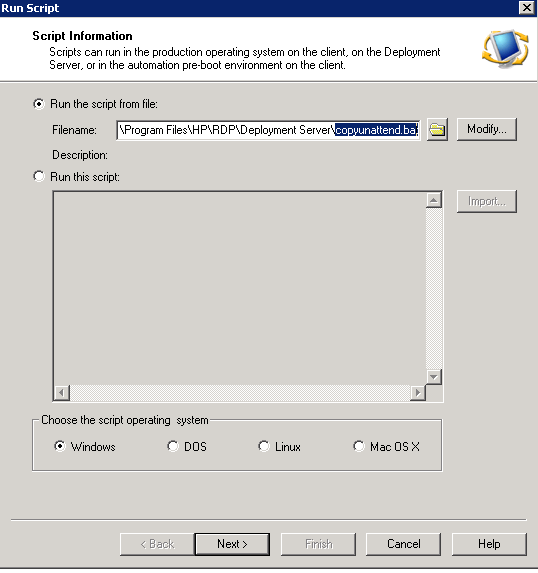 2)Create a batch file in C:\Program Files\HP\RDP\Deployment Server called copyunattend.bat. Enter the following information assuming you c:\ drive is you system drive. 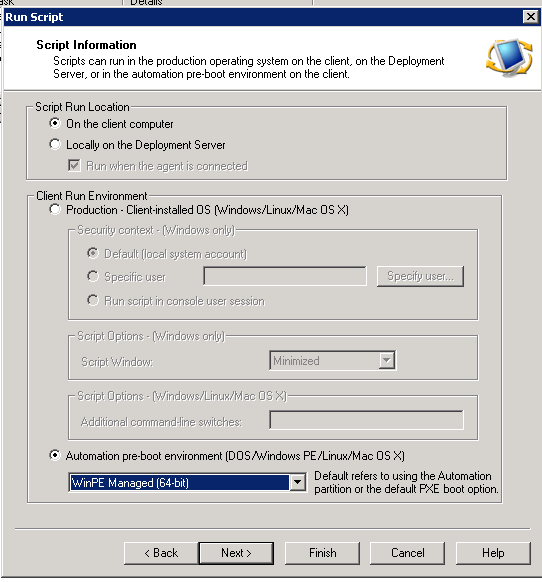 5)Select “Automation pre-book environment” and chose “WinPE Managed (64 Bit)” and click next. 6) Click next and click finish on the last windows. This is also you should have to do. There is seem to be no fix from HP or Symantec yet.